After booking our plane tickets the next step was actually getting allowed into the country. As an American, Australia allows you to submit an Electronic Travel Authority (ETA), it replaces a visa stamp by filling out an online form and of course a $20 AUS payment (per person). We were both approved 'instantly' and should hopefully allow a smoother entry once we land. Information for this process is was all through the US Department of State's website: http://travel.state.gov/travel/cis_pa_tw/cis/cis_954.html. While we were a little surprised the need to for the ETA of all the countries that require visas AU seems to be the easiest, about a 5 minute process each. No one really talks about this in any decisive form. Sure everyone mentions you can purchase a single round the world fare from one of the partner alliances (OneWorld, Star Alliance, etc.) or you can just book one way flights as you go, but no one ever gives you much more than that. Luckily we’ve managed to connect with several people who are either currently on a world trip or have already taken one. With some real world suggestions we’ve decided to go with the one way ticket idea. It allows for the utmost flexibility and quite frankly adds quite a bit to the adventure. Now I guess the key to the one way ticket is actually being able to book that next ticket, or group of tickets. Here’s where one of my new favorite travel companions comes in, a computer! The next suggestion was to bring a computer on the trip, which is something we initially decided against, even though I’m a huge geek. After this suggestion it really seemed to make sense and not just for the sake of booking tickets, but also being able to more easily keep in touch as well as one of the other challenges: managing the gigabytes of photos we’d be taking along the way (I’ll post more about the photography issue later). So there you have it. We are going with the one way ticket and I get to bring another gadget. Our plan is to book our first few legs ahead of time and then any major flights well in advance, but anything local or spur of the moment will be on the fly (pun intended). Our first thoughts about planning a round the world trip involved “where to we start”, “what do we bring”, “when do we buy our tickets”, etc. We started by reading as much as we could, blogs, websites, etc. 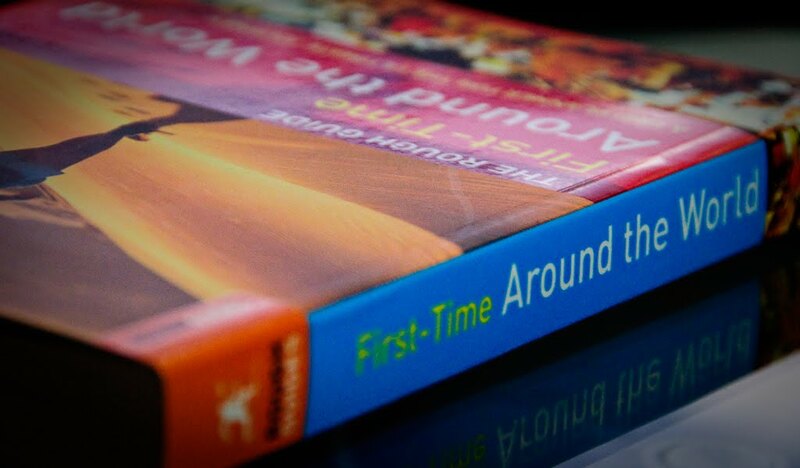 We also picked up a book “The Rough Guide: First-Time Around the World“. It has proved to be an excellent resource. It talks about planning the trip (when start planning and booking), actually traveling and what to do when you get back (basically re-acclimating to your “old” life).